My project involves an ethnographic foray into the field of law and religion. In India, the condition of legal pluralism is framed within the constitutional commitment of the secular, democratic state. Article 29 (1) of the Indian Constitution promises that “any section of the citizens residing in the territory of India or any part thereof having a distinct language, script or culture of its own shall have the right to conserve the same.” The Islamic courts (Darul Qaza) function within this constitutional framework. The decrees of these courts are not enforceable and act as advisory. Every citizen has the right to approach the civil court as and when deemed necessary. This context of judicial pluralism exists in uncomfortable tension with the Directive Principles of the Constitution of India’s commitment to the formulation of a uniform civil code. While the issue of personal law of religious minorities, especially of Muslims, has been the cynosure of the uniform civil code debate, there is paucity of ethnography on the procedure of adjudication in both civil and religious courts and the litigants’ experience of conflict resolution. The present project draws on ethnographic material from the religious and civil courts of two cities – Kanpur and Lucknow – in northern India. It attempts to show how the manifold patterns and processes operative within the judicial system portray a unique form of India’s “tryst” with secularity.I will be using the ethnographic method for this project. It is planned to interview women who have approached (or chose not to approach) the courts in contexts of divorce or maintenance. In addition to undertaking observation and interviews, we shall also look into the court records, both at the civil and religious courts. Chakrabarti, Anindita, and Sudha Sitharaman, eds.Religion and Secularities: Reconfigurations of Islam in Contemporary India (Book proposal accepted by Orient Blackswan). Ghosh, Suchandra, and Anindita Chakrabarti. “Imam, Qazi and the Judge: An Ethnography of Judicial Reasoning,” in Religion and Secularities: Reconfigurations of Islam in Contemporary India, edited by Anindita Chakrabarti and Sudha Sitharaman (forthcoming with Orient Blackswan). 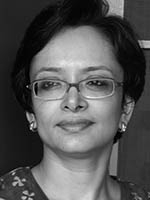 Chakrabarti, Anindita. Faith and Social Movements: Religious Reform in Contemporary India. Cambridge: Cambridge University Press, 2018. Anindita Chakrabarti and Suchandra Ghosh. “Judicial Reform vs. Adjudication of Personal Law: View from a Muslim Ghetto in Kanpur,” Economic and Political Weekly 52/49 (Dec 2017): 12-14. Chakrabarti, Anindita. “Democracy as Civil Religion: Reading Alexis De Tocqueville in India.” Journal of Human Values, 22/1 (January 2016): 14–25. Chakrabarti, Anindita. “The Role of Critical Thinking in Religion: A Sociological Perspective.” Vidyajyoti Journal of Theological Reflection, 76 (December 2012). Chakrabarti, Anindita. “Soteriological Journeys and Discourses of Self-Transformation: the Tablighi Jamaat and Svadhyaya in Gujarat,” in Gujarat Beyond Gandhi: Politics, Conflict and Society. Edited by Nalin Mehta and Mona G. Mehta, 131–48. New Delhi: Routledge, 2011. Chakrabarti, Anindita. “Soteriological Journeys and Discourses of Self-Transformation: the Tablighi Jamaat and Svadhyaya in Gujarat.” South Asian History and Culture, 1/4 (October 2010): 597–614. Chakrabarti, Anindita. “Initiation, ‘Re-birth’ and the Emergent Congregation: An Analysis of the Svadhyaya Movement in Western India,” in Ritual Matters: Dynamic Dimensions in Practice. Edited by Christiane Brosius and Ute Hüsken, 49–75. London: Routledge, 2010. Chakrabarti, Anindita. “Judicious Succession and Judicial Religion: Internal Conflict and Legal Dispute in a Religious Reform Movement in India,” in Permutations of Order: Religion and Law as Contested Sovereignties. Edited by Thomas Kirsch and Bertram Turner, 87–106. London: Ashgate, 2009.